A zero downtime bunion procedure is now a reality. PA Foot and Ankle Associates is the first podiatric practice in the Lehigh Valley (and one of only two on the U.S. east coast) to offer a revolutionary new bunion correction procedure called the FastForward System. FastForward offers minimal discomfort, minimal scarring and no downtime for the patient. A bunion, known medically as a Hallux valgus deformity, is a prevalent and debilitating foot condition that affects 23% of people age 18-65 each year. 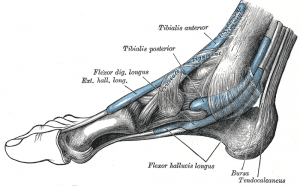 Prior to the invention of FastForward, a bunion was treated surgically by means of a bunionectomy. This foot surgery used a series of bone cuts and bone screws to realign the first metatarsal – the longest bone in the foot – with the big toe. As cuts to realign bone are by their nature traumatic, bunionectomies require the patient to stay off of their feet for a period of days, followed by a recovery period of 1-2 months. The larger the bunion deformity, the more aggressive the procedure, leading to longer recovery time and downtime for the patient. With the FastForward procedure, a patient can walk immediately after surgery (in a protective shoe) and can be back in a sneaker in 2-3 weeks. FastForward also eliminates certain painful complications which occur in some bunionectomy patients – namely, intolerance to bone screws or bones which don’t heal correctly. These complications often required a 2nd surgery to correct. The key to this new bunion procedure is the FDA-approved FastForward Bone Tether Plate. The unique design of this medical device, achieved through 3D printing technology, allows an as-close-as-possible match to the anatomy of the second metatarsal (3D printing allows for the fabrication of devices with complex geometries). Working through a tiny incision, the podiatric surgeon anchors the FastForward Bone Tether Plate to the 2nd metatarsal, wraps the 1st and 2nd metatarsals with suture tape, and then safely pulls the bones and big toe into proper alignment. Less drilling and bone cutting means a quicker recovery and less pain for the patient. Previous bunion correction procedures which pulled the metatarsals into alignment, required drilling into the 2nd metatarsal, subjecting it to significant stress. For some patients, this resulted in fractures of the 2nd metatarsal. The FastForward Bone Tether Plate eliminates that complication, as it conforms to the shape of the bone and requires no drilling of the 2nd metatarsal. Linda woke up one day surprised to find a sudden loss of sensation and tingling in her feet. her family physician and neurologist were unsuccessful in treating her neuropathy, so she turned to East Penn Foot And Ankle Associates for MicroVas Therapy. After 18 treatments, Linda’s sense of feeling in her feet is restored and she is able to exercise again.